Welcome to the seventh installment of a new series of NSX troubleshooting scenarios. Thanks to everyone who took the time to comment on the first half of scenario seven. Today I’ll be performing some troubleshooting and will show how I came to the solution. In the first half of this scenario, we saw that our fictional customer was hitting an exception every time they tried to convert their secondary – now a transit – NSX Manager to the standalone role. The error message seemed to imply that numerous universal objects were still in the environment. This is indeed a list of everything the customer claims to have deleted from the environment. From the perspective of the ‘Transit’ manager, these objects still exist for some reason. First, he disconnected the secondary NSX Manager from the primary. This was successful, and it changed its role from Secondary to ‘Transit’. Next, he attempted to convert it to a ‘Standalone’ manager. This failed with the same error message mentioned earlier. This seemed valid, however, because those objects really did exist. At this point, he removed the remaining universal logical switches, edges and transport zone. These were all deleted successfully. The subsequent attempts to convert the manager to a ‘Standalone’ continue to fail with the same error message even though the objects are gone. 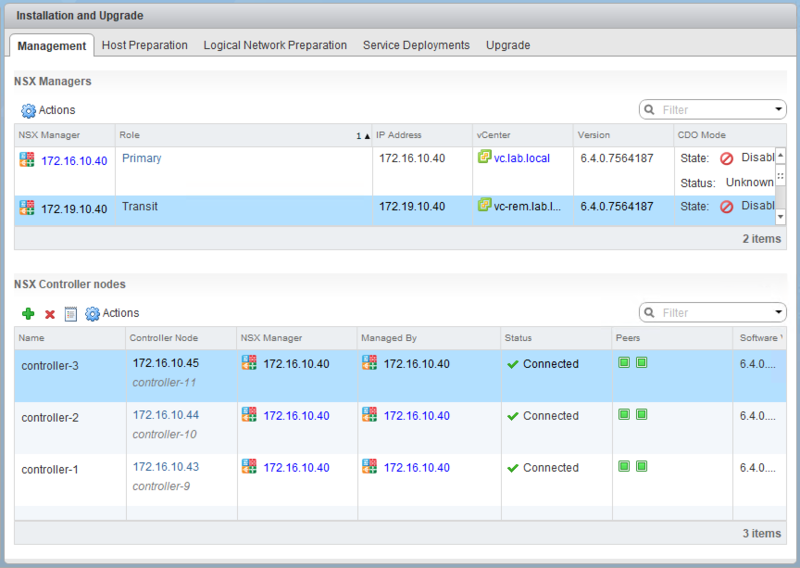 Notice the very first step – they disconnected the secondary from the primary NSX Manager. Welcome to the seventh installment of my NSX troubleshooting series. What I hope to do in these posts is share some of the common issues I run across from day to day. Each scenario will be a two-part post. The first will be an outline of the symptoms and problem statement along with bits of information from the environment. The second will be the solution, including the troubleshooting and investigation I did to get there. Well, this seems odd. Let’s look at the environment and try to reproduce the issue to see what the exact error is. Welcome to the sixth installment of my new NSX troubleshooting series. What I hope to do in these posts is share some of the common issues I run across from day to day. Each scenario will be a two-part post. The first will be an outline of the symptoms and problem statement along with bits of information from the environment. The second will be the solution, including the troubleshooting and investigation I did to get there. Well, this sounds like a ‘chicken or the egg dilemma’ – how can they recover if they can’t log in to the vSphere Web Client to revert the changes that broke things? In speaking with our fictional customer, we learn that some rules are in place to block all HTTP/HTTPS access in the compute cluster. Because they are still deploying VMs and getting everything patched, they are using this as a temporary means to prevent all web access. Unfortunately, he can’t remember exactly what was configured in the firewall and there may be other restrictions in place. 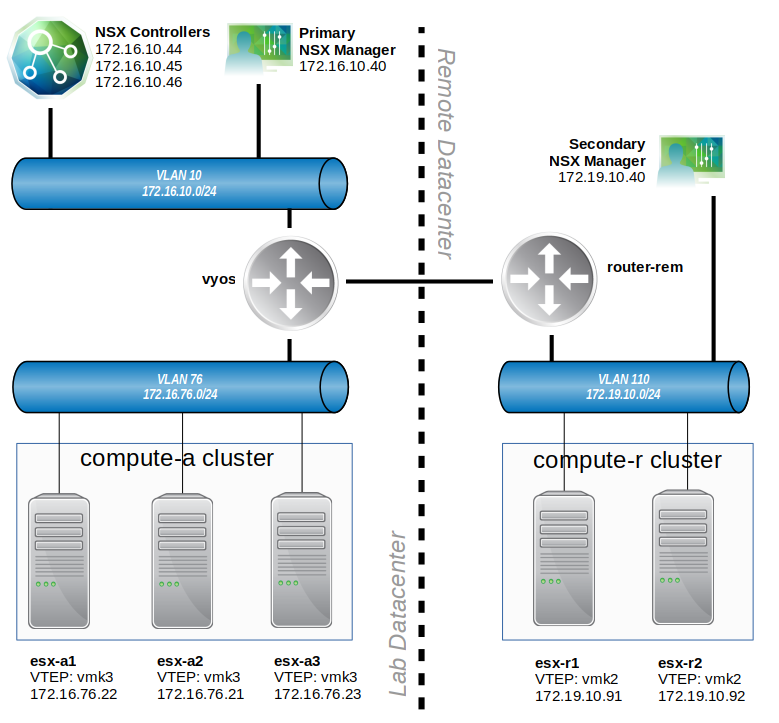 Welcome to the fourth installment of a new series of NSX troubleshooting scenarios. Thanks to everyone who took the time to comment on the first half of scenario four. Today I’ll be performing some troubleshooting and will resolve the issue. During the scoping in the first half of the scenario, we saw that the problem was squarely in the customer’s new secondary NSX deployment. Two test virtual machines – linux-r1 and linux-r2 – could not be added to any of the universal logical switches. As we can see above, the port groups do exist for logical switches in the VNI 900x range. These are non-universal, logical switches available to the secondary NSX deployment only. So why are these port groups missing? Without them, VMs simply can’t be added to the associated logical switches. Although you’ve probably noticed that I like to dig deep in some of these scenarios, this one is actually pretty straight forward. A straight forward, but all too common problem – the cluster has not been added to the universal transport zone. You’d be surprised how often I see this, but to be fair, it’s very easily overlooked. I sometimes need to remind myself to check all the basics first, especially when dealing with new deployments. The key symptom that raised red flags for me was the lack of auto-generated port groups on the distributed switch. The addition of the cluster to the transport zone will trigger the creation of these port groups. If they don’t exist, this should be the first thing that is checked. I’ve now essentially told NSX that I want all the logical switches in that transport zone to span to the compute-r cluster. In NSX-V, we can think of a transport zone as a boundary spanning one or more clusters. Only clusters in that transport zone will have the logical switches available to them for use. The concept of a ‘Universal Transport Zone’ just takes this a step further and allows clusters in different vCenter instances to connect to the same universal logical switches. The fact that we saw portgroups for the 9000-900X range of VNIs tells us that the compute-r cluster existed in the non-universal Transport Zone called ‘Remote TZ’, but was missing from ‘Universal TZ’. Thanks again to everyone for posting their testing suggestions and theories! I hope you enjoyed this scenario. If you have other suggestions for troubleshooting scenarios you’d like to see, please leave a comment, or reach out to me on Twitter (@vswitchzero). Thanks to everyone who took the time to comment on the first half of scenario 3, both here and on twitter. There were many great suggestions, and some were spot-on! For more detail on the problem, some diagrams and other scoping information, be sure to check out the first half of scenario 3. During the initial scoping in the first half, we didn’t really see too much out of the ordinary in the UI aside from some odd ‘red alarm’ exclamation marks on the compute-r hosts in the Host Preparation section. More than one commenter pointed out that this needs to be investigated. I wholeheartedly agree. Despite seeing a green status for host VIB installation, firewall status and VXLAN, there is clearly still a problem. That problem is related to ‘Communication Channel Health’. The communication channel health check was a new feature added in NSX 6.2 and makes it easy to see which hosts are having problems communicating with both NSX Manager and the Control Cluster. In our case, both esx-r1 and esx-r2 are reporting problems with their control plane agent (netcpa) to all three controllers. Welcome to the third installment of my new NSX troubleshooting series. What I hope to do in these posts is share some of the common issues I run across from day to day. Each scenario will be a two-part post. The first will be an outline of the symptoms and problem statement along with bits of information from the environment. The second will be the solution, including the troubleshooting and investigation I did to get there. There isn’t a lot of detail above, but it helps to give us some talking points. The main location is depicted on the left. A three host cluster called compute-a exists there. All of the VLAN backed networks route through a router called vyos. The Universal Control Cluster exists at this location, as does the primary NSX manager.